Do you suffer from episodes of back pain? Would you like back exercises that reduce your risk of dowagers hump? Maybe you’re simply looking for quick exercises that keep your spine strong and healthy (and your pelvic floor safe). These 4 Physiotherapist-guided back exercises help you strengthen your spine and exercise safely. Please scroll down below this video to check your suitability, tips for keeping these back exercises safe and step-by-step guidelines. Can Back Exercises Improve Pelvic Floor Problems? Yes! Having a healthy back and good upright posture are both very important for your pelvic floor. When you have back or pelvic pain your pelvic floor muscles don’t work as effectively. This is why some women notice worsening prolapse symptoms or incontinence with lower back pain. When your posture is slumped forwards your deep supportive core muscles can’t work effectively. Good upright posture optimises your pelvic floor and deep abdominal muscle support for your trunk. Michelle Kenway is a Pelvic Floor Physiotherapist and author of Inside Out – the Essential Women’s Guide to Pelvic Support, along with Dr Judith Goh Urogynaecologist. 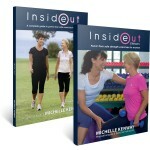 The Inside Out exercise DVD and book show women how to exercise safely and effectively with pelvic floor safe exercises. This routine is a general back strengthening exercise routine for the upper and lower back. These exercises will suit most women seeking a gentle healthy back exercise routine. Start the exercises slowly and progress the number of exercises you complete gradually. You may choose to do back strengthening exercises at intervals throughout the day – every little bit contributes to a stronger healthier back. Every body is different and no one exercise program can suit everyone. If you have an existing back problem seek the approval of your health care provider before commencing new back strengthening exercises. In the unlikely event you experience any back discomfort associated with any of these exercises cease that exercise. Push back exercise strengthens the muscles between the shoulder blades. This is a great exercise for improving upright posture and reducing neck and shoulder strain during regular activity. Always keep your chin tucked in and your forehead supported when doing exercises lying down prone on the mat. This will help you to minimise your risk or neck pain or neck injury. Positioning a pillow or cushion under your pelvis can help to reduce the risk of lower back discomfort when doing exercises in prone position. This is recommended but not essential if your back feels comfortable without a support. Stop sign strengthens the muscles in the middle back and the back of the shoulders. This is a terrific back strengthening exercise for promoting upright posture and avoiding slumped forwards upper back posture. Slumped forwards posture can increase the likelihood of spinal fractures with osteoporosis. If you are prone to shoulder problems keep your elbows close to the sides of your trunk or avoid this exercise in favour of push back exercise (above). This exercise strengthens the lower back. Lower back extension exercise has been shown to benefit women exercising for lower back bone health. If you are prone to lower back pain avoid raising your trunk too far from the ground – keep your back raises smooth and controlled. Alternate arm and leg raises strengthen the spine and the deep abdominal muscles. This is an excellent spinal rehabilitation and core control exercise. I hope you enjoy these back exercises and that they help you towards gaining strong supportive back muscles and good upright posture. Feel most welcome to leave your comments and questions about back strengthening exercises below. Hi Michelle, I would like to take this opportunity to thank you for sharing such helpful information. Your expert knowledge and assistance has made such an improvement in my life and I’m sure in the lives of all those you touch. Thanks once again. Marg Nugent. Marg it’s my privilege to work with you – you are an inspiration in what you do and what you have achieved. When I see how strong and well you are and the hurdles you have overcome I am truly thrilled for you. Keep up your great work Marg! I am recovering from vaginal rectal prolapse surgery 3 1/2 weeks ago, and wanted to thank you for the wonderful information on appropriate excercises for pelvic floor strengthening. I also have facet jount arthritis in my lower spine, and I am wondering if the back excercises are ok for me to do? Thanks for your question! Wait until you have your doctor’s approval before recommencing exercises post op. When you have this approval these back exercises will be the type of general strengthening exercises that are appropriate. You will notice i use a pillow under my hips with the exercises – this is for women like yourself; with facet joint arthritis when you lay down prone the facets close up. By using a pillow (in your case I would use two) you will find that these types of exercises can be performed without discomfort. I would be inclined to leave the 3rd exercise (back extensions) from the routine or only do a very small lift if you do this exercise as it is the one exercise that closes the facet joints which your lower back may not like. Dear Michelle, Thank you so much for putting together this wonderful site! You are answering all of the questions that I have had in the 20 years since my diagnosis! You are helping so many women, God bless you! Ok, here’s my question. I feel pelvic pressure when I do back exercise #3 (lower back extension). Am I doing something wrong? Thanks for your comment – yes this may well be correct. I don’t believe that it’s because you’re doing something wrong – rather that your pelvic floor isn’t withstanding the pressure the exercise generates. Try not extending back as far ie keep extension very small range. In classes I often get ladies to use a pillow under the pelvis (not the belly) to reduce the amount of hyper-extension in the lower back with this exercise. Let me know how you go Carol. If you still feel symptoms leave it out.